Kyoto’s Eikan-do Zenrin-ji is the head temple of the Seizan branch of Pure Land Buddhism in Japan. 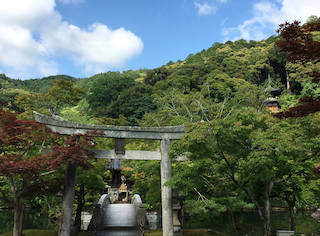 The temple sits near the southern end of the famous Philosopher’s Path, and although it’s famous for autumn foliage, the temple gardens are spectacular year-round. The photo above shows the path that leads from the gardens (and pagoda hill) down to the temple’s beautiful lake. Yesterday at Murder is Everywhere, I posted a blog about the traditional hanami – “flower viewing” – parties that happen at sakura (cherry blossom) season. (Photo credit: Xyrenth – used with permission.) Cherry blossoms are such an important part of Japanese culture that the Japanese National Tourism Organization (and other media outlets) publish an annual “sakura forecast” predicting the date when cherry blossoms will open across Japan.